Dear kids this interesting story tells us that if we will be bad and cruel to others then others will not be kind to us. 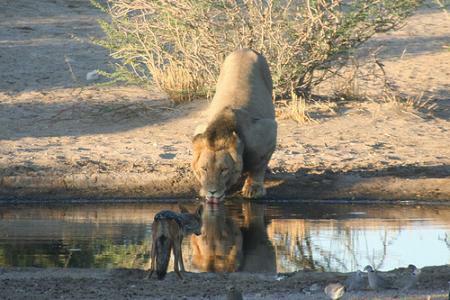 In one jungle a jackal and lion were very close friends. Lion was the king of the jungle and the jackal was his minister. All the animals of jungle were very happy from lion but the jackal wanted to kill the lion and become the king himself. One day he thought of a plan. The lion used to go every noon near the river to drink water. He made a plan to hide a net there. “When he will come to drink water, he will be caught in the net and afterwards I will throw the net in the river and I will be the king.” He thought to himself and began to laugh. After saying this he threw the lion into the river. Then he announced in the jungle that the lion has died and he is the king of the jungle. After some days he began to be cruel to the animals and some animals left the jungle due to his cruelty. After some weeks a lion escaped from the zoo and came into that jungle. He saw that a bear was sad. When the lion knew about that that jackal, he was furious. He got the address of jackal and went that way. The jackal tried to escape but the lion tore him into pieces. All the animals made lion the king of the jungle and all the animals of jungle became happy again. Since then any lion has not made any jackal a friend.